On MSNBC’s Morning Joe today, Steven Rattner presented charts showing the extent to which applicants to elite colleges and universities may get special treatment. The college admissions scandal known as “Varsity Blues” has focused attention on the process by which young Americans are admitted to the nation’s colleges and universities, particularly the elite ones. What has gotten less attention is that there are multiple doors into these institutions – and a tough path for those trying to get in through the front door. As a result of a lawsuit against Harvard claiming discrimination against Asian Americans, a wealth of data has been unveiled about who gets into Harvard and why. Harvard is, of course, among the most selective universities in America; only about 6% of applicants have been accepted in recent years. (For the most recent class, which will graduate in 2023, the admit rate was just 4.5%). But for some students, the route is easier. If you are a legacy (meaning that a close relative attended Harvard College), your chances of getting in rise to around 34%. If you’re on the “Dean and Director’s Interest List” (meaning that your parents are rich or famous or both), your changes are 42%. That’s roughly the same as the acceptance rate for the small number of children of Harvard faculty and staff who apply in a given year. But if you are a recruited athlete, your probability jumps to a whopping 86%. (It’s important to note that the Ivy League schools have certain minimum academic criteria that recruited athletes must meet and coaches work closely with admissions office to ensure their candidates qualify). 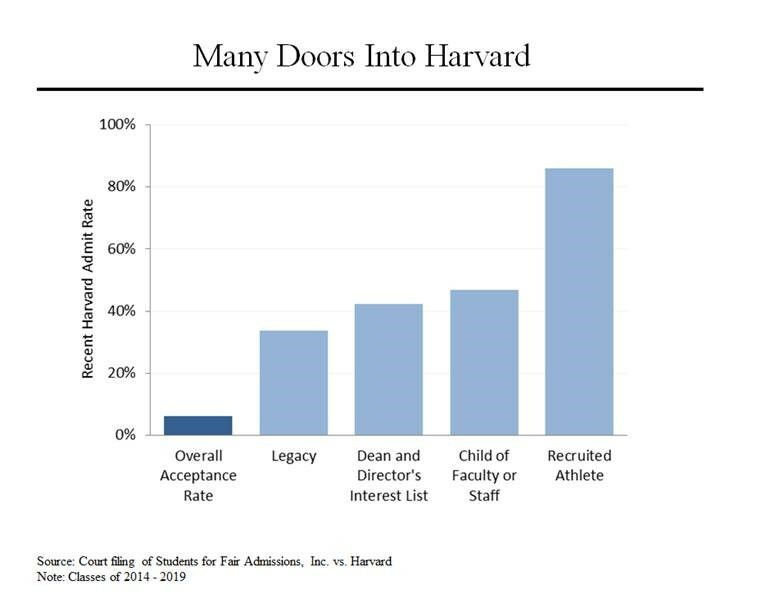 So not surprisingly, the composition of a typical Harvard class is crowded with these special admissions cases. 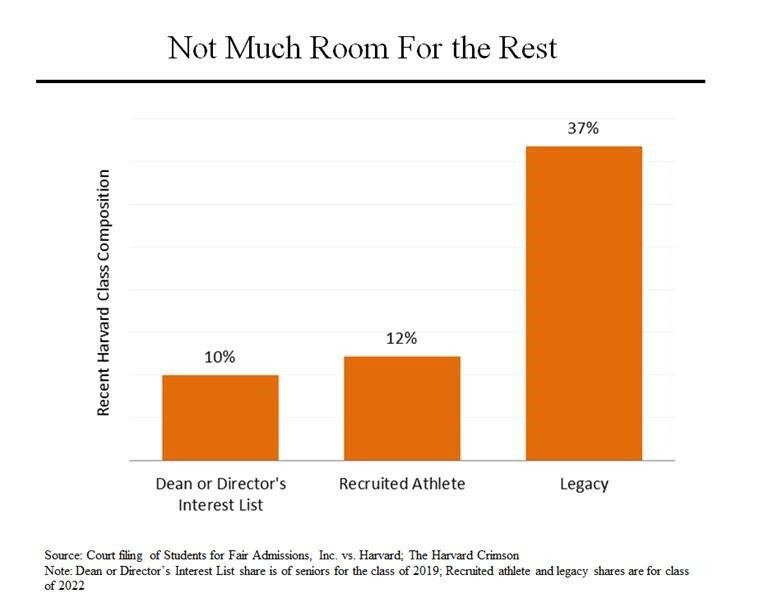 Recent classes have been comprised of about 10% of the rich or famous, 12% of recruited athletes and an astounding 37% of legacies. (There may be some double counting in these totals; a legacy could also be on the “interest list”). It is also important to note that Harvard’s legacy percentage appears to be substantially higher than that at other comparable institutions. 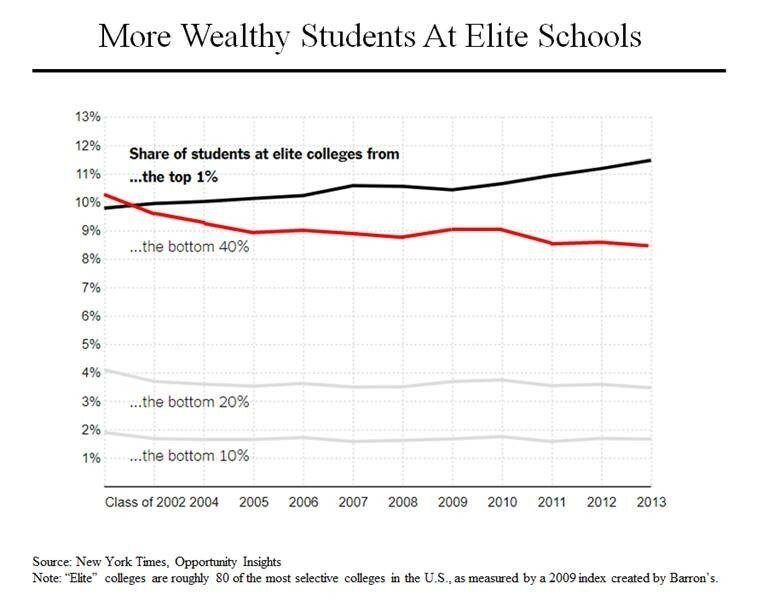 A third obstacle for average Americans is that the share of students at 80 of the most selective colleges and universities who come from the top 1% (based on family income) has been rising while representation from the bottom 40% has been falling. Various factors account for this. Income inequality has grown while tuition has soared, making it harder for less advantaged students to attend, even though these schools have strived to increase their financial aid packages. And changes to Pell grants, which typically go to the bottom 40%, have raised the income cutoff for families to qualify.